....sometimes a little hard work really does save us time.... You are investing time now for freedom later. The author is speaking here of the time and work it takes to prepare and preserve food, for example making and canning spaghetti sauce. Even though it's a lot of work up front, in the end it means being able to simply grab the jar for a quick winter meal, rather than having to always start from scratch. I too, have found this to be true, not only in terms of storing and using our food, but in a broader sense as well, in regards to our homesteading goals. Our goal is a simpler lifestyle, i.e., to get as far away from the rat race as possible. We don't even want a seat in the bleachers. While most of the world madly pursues the unquenchable goal of accumulating money, possessions, and financial security (often at any cost), Dan and I prefer to invest in our land, and in the resources we need to achieve our goal. To us, this is freedom, and it is worthy of our time, effort, and indeed, hard work. If all else fails, we can still eat. We can still stay warm during the fiercest winter storm, and we can still have a sense of purpose and fulfillment in our lives. This is a freedom one can't buy with money. It is probably the goal of almost every homesteader amongst us. It is the fruit of our hard work. Now, what did I do this past week to work toward that goal? Bought shelving for the new pantry. Was going to build them, but found we could get heavy duty plastic ones for half the price of the materials to build them. So it was both a money and time saver. Bought a few new to us videos at the thrift store. We don't have digital TV, satellite or cable, so videos and DVDs are our only TV entertainment. Found a long, thick, terry cloth bathrobe at the thrift store & bought it. Even though I don't need it this time of year, I've been looking for a warm one to replace my old. Winter clothing sold new in this part of the country isn't as heavy and warm as what can be bought in the north. Manufacturers seem to think that "south" equates to "warm winters." Not so! 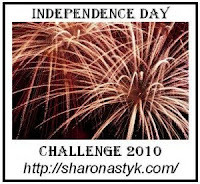 For more Independence Days Challenge updates from more participants, click here. I stopped reading Sharon Astyk a while ago because, even though the information was good, she was just way too wordy. But it is right about learning independence, these skills are good to know, even if we don't feel inclined to use all of them. I love seeing all the growth and changes on your homestead! It is really coming along and looking great! As far as goats you may want to look at a few dual purpose goats and see if anyone in your area may have them such as Kinder goats which can be used for milk or meat and a very sturdy built little goat which gives okay milk production. Daharja, she is wordy, *LOL, and it's hard to find time during planting season to do alot of reading. I don't agree with everything she says,and I have to admit that a lot of the things in her book are things we already do. The challenge though, is a good motivator for me. And I'm happy to read her book to glean any new ideas. Rainbow Rivers, I've read about Kinder goats and did look around to see if I could find any locally. So far I've only come up with a dead end. The other alternative is to breed our own. That's a possibility too, though at this point we aren't set up to keep a buck around. Still, it's worth considering. If not for now, then in the near future.